If you do not follow Niagara wine, or simply show a passing fancy, the name Tawse may mean little to you. To those with a slight bit of knowledge the name may simply mean Chardonnay. To anyone who has spent time in the region the winery is a great deal more than that. Well for the Canadian Wine Guy it has a double entendre, one is the winery which is Mrs. CWG chardonnay producer of choice; the second is the connection of the family Tawse to the Scottish clan my mother’s side comes from, the Farquharsons. While genealogy has nothing to do with this blog I am always fascinated that my own gene pool is intertwined with Moray Tawse the proprietor. Where to start with the winery itself? In 2010 the winemaker Paul Pender and company brought home a plethora of awards in 2010 including Canadian Winery of the Year by Wine Access Magazine. Paul has since been named 2011 Winemaker of the Year at the Ontario Wine Awards. With all these accolades, one would think Dieter Unru, the retail manager at Tawse, would be pounding his chest and saying “look at us”, but this really is not the case. If you visit the winery you will see a man, and his staff, who are proud not of the awards but the wine itself. On our visit we were treated to an excellent overview of the current wines that were available as well as tidbits and stories on the process and the winemaking philosophy. While this is not unusual for a good winery, it is always a pleasant outcome. Dieter, when asked to suggest a wine for this review, selected the new Spark offering instead of a safer selection (be it their amazing Robyn’s Block Chardonnay or one of their outstanding Pinot’s), this in itself ‘sparks’ a confidence in their newest undertaking. A rare sight on a bottle of classic methode wine from Niagara, the 2008 vintage is the first sign that this is an interesting bottle as most of the region’s sparkling wines rarely (if ever) have a vintage associated with them. The wine is crisp, clean and palate cleansing. It has an even acidity that helps pump up the underlying fruit aromas that come to your nose slowly and softly. Tart green apple is very apparently but hints of grapefruit and lemon (i was shocked by this) seep in. This wine was forward on the tongue but the complexity and balance are there. 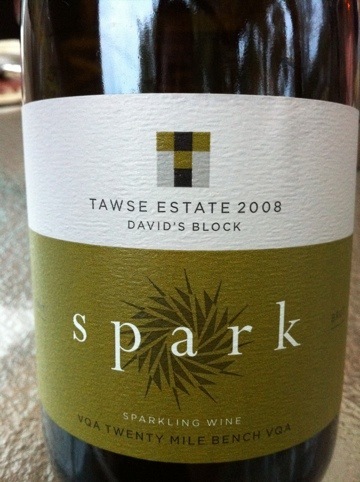 Overall this is an excellent sparkling wine, one that can be mentioned with some of the best that Niagara has to offer. Sadly (well maybe not if your view is to enjoy a winery visit) this is only available from the vineyard. At $39.95 it is on the higher side but if you are looking for quality you will find it here. Dieter, this is for you: excellent and unexpected choice, I knew you and Tawse were more than Chardonnay and it is nice to see it in this bottle. PS: the winery fresh eggs are worth the trip as well, how often can you buy great wine and get fresh warm free-range eggs? This entry was posted in Canadian, Wine and tagged niagara, TAWSE, wine review. Bookmark the permalink.